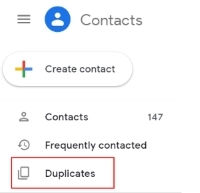 When copying & pasting email addresses into the recipients list in Gmail, how can I remove duplicate email addresses (if the copied list contains duplicates)? You can paste them first into a tool like this one or others. It's not entirely safe to put private info into online tools, but you can save such a webpage to disk and use the tool offline. How to get the list of email addresses in a Gmail labelled folder? How to make Gmail receive email only from one account?